What I’m writing about in this post is not a long-term survival strategy. I have never, thank God, been in a long-term survival situation; but I am in short situations all the time where I can’t depend on any outside power. It’s just one of the down sides of living in the country. The power goes out, sometimes for an hour, sometimes for days. I am pretty well equipped for power outages. We have a propane cook stove, wood heater, kerosene lamps, bottled water dispenser, hand-crank radio, and a good generator with plenty of fuel. When we crank up the generator life is almost normal except for one thing. Cool air. You see, our house, like most these days, has central air; and our generator is not powerful enough to run a central air unit. Now if you’ve never been in hot, humid, muggy, East Texas in July and August; you probably think air conditioning isn’t all that important to survival. And you’re right. You can survive without it. I lived here for quiet a few years without any air conditioning, and I survived. But here’s the thing. I enjoy being cool, and if I can be cool without too much trouble I’m going to be cool. So, when my local hardware store put their little Frigidaire window units on sale for $100 dollars, I went down and bought one. There’s no installation other than sitting it in the window and pulling out the little side curtains. It runs on 110v. current and it only draws 515 watts of power, well within the capability of my generator. It is not a big unit, but it is enough to cool down one bedroom very nicely. Yesterday I got the chance to try out my new toy. It had been overcast and muggy all day, temperatures in the 90’s. Just before sundown a storm blew through bringing some much needed rain, unfortunately it also knocked out the power. 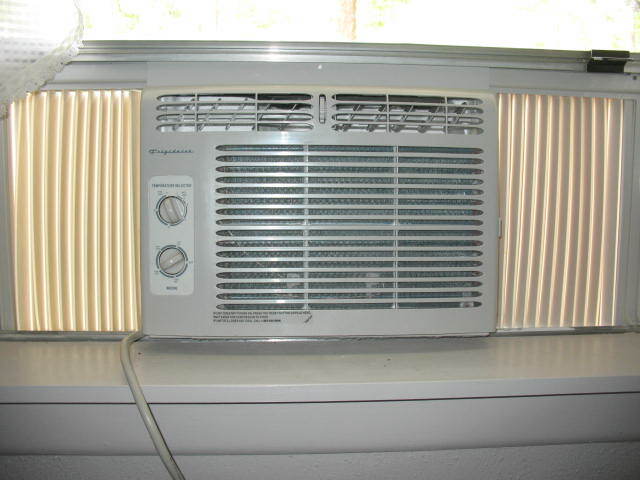 The house hadn’t really started getting hot yet, but I wanted to see how my new A/C would work; so I cranked up the generator, plugged in the window unit, and turned it on. Ah, cool air. The power was only out for about three hours, but at the end of that three hours the rest of the house was getting noticeably warm. My bedroom was as cool as a fall day. I was pleased with this trial run, and the next time we lose power for 4 or 5 days in the summertime I’ll know that I can sleep cool.